NEWPORT BEACH, Calif -- It's most likely purely coincidence that the yearly spectacle of Shark Week coincides with a large harvest of sometimes record-breaking mako sharks off Southern California's coast. At this time last year, when the Discovery Channel was holding its 25th Shark Week, one mako reeled in weighed 750 pounds before breaking the scale. Another, only 6 weeks apart, was sized at 10 feet, 3 inches. Just this past June, Corey Knowlton of Jim Shockey's "The Professionals" on Outdoor Channel was on board filming when a 1,323-pound mako was caught off the coast of Huntington Beach. The monster took angler Jason Johnston nearly two hours to reel in. "He took out a quarter-mile of line," Johnston told Los Angeles's KTLA. "And five times he came out of the water over 20 feet. This thing is definitely a killing machine. Any wrong step, I could have gone out of the boat and down to the bottom of the ocean." Johnston continues his wait to find out from the International Game Fish Association (IGFA) if it will best the All Tackle World Record from a 1,221-pound mako caught off Chatham, Mass. 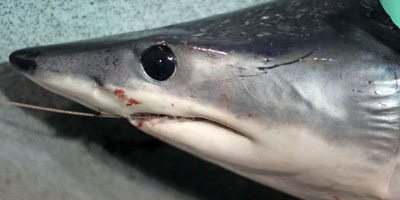 Mako sharks are an apex predator in the offshore blue waters. Famed writer Ernest Hemingway provided one of the best descriptions, before video was ever available, and it remains incredibly accurate. "He was a very big mako shark, built to swim as fast as the fastest fish in the sea and everything about him was beautiful except his jaws. His back was as blue as a swordfish's and his belly was silver and his hide was smooth and handsome. He was built as a swordfish except for his huge jaws. Which were tight shut now as he swam fast, just under the surface with his high dorsal fin knifing through the water without wavering. Inside the closed double lip of his jaws all of his eight rows of teeth were slanted inwards. They were shaped like a man's fingers when they are crisped like claws. This was a fish built to feed on all the fishes in the sea, that were so fast and strong and well armed that they had no other enemy." The 80-foot Western Pride, part of the Davey's Locker daily fleet of fishing boats in Newport Beach, motored out to the same area where the 1,323-pound mako shark was caught. And with warming conditions, the chances of catching a mako was a likely possibility. A few miles offshore and after sunset, 15 conventional reels with 50-80 pound line were baited with mackerel and barracuda bellies and dropped into the black Pacific. Deckhands also tied two balloons to each line, which would serve as the tell-all sign - if the balloon danced, a shark would be on the other end, chomping away. After two hours of furious boat rocking, a balloon danced, followed by shouts of excitement from the fishermen. One began to reel, but the mako slipped off the line. This happened three more times throughout the next hour, and the lesson became clear - don't let the shark just nibble at the bait. Let it eat and swallow. Then reel. Just after midnight, that lesson was put into action. After a mako swallowed the bait, a fisherman furiously reeled in the shark. A deckhand gaffed the 5-foot shark and pulled it in the boat, immediately cutting the top of its head, where a crucial nerve lies. This was done to keep the shark from thrashing around the boat, potentially causing harm. Another deckhand put it this way - "when it gets in the boat, the sucker can run." The shark was filleted, provided five bags of meat and gave each fishermen on board an adrenaline packed Shark Week of their own.